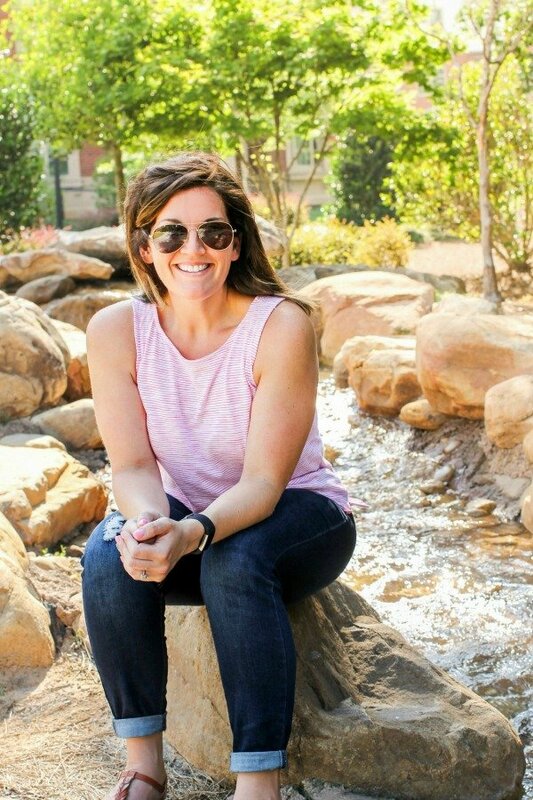 January 31, 2019 By Allyson 17 Comments This post may contain affiliate links. Read my disclosure policy. Crispy, cheesy, and majorly delicious; these Air Fryer Crispy Parmesan Brussels Sprouts are going to be your new go-to side dish. Only a handful of ingredients and only 132 calories per serving! These crispy Brussels sprouts are going to blow your mind! They are AMAZINGLY delicious, crunchy, cheesy, salty, and soooooo good! They are the best Brussels sprouts I’ve ever had! Making them in the air fryer took half the time of roasting and was so easy! 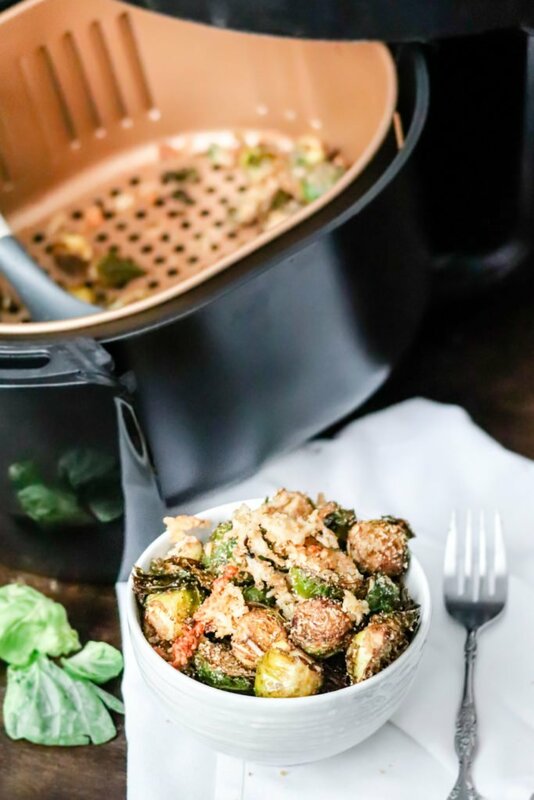 I highly recommend you try these Air Fryer Crispy Parmesan Brussels Sprouts as a side dish during your next meal! 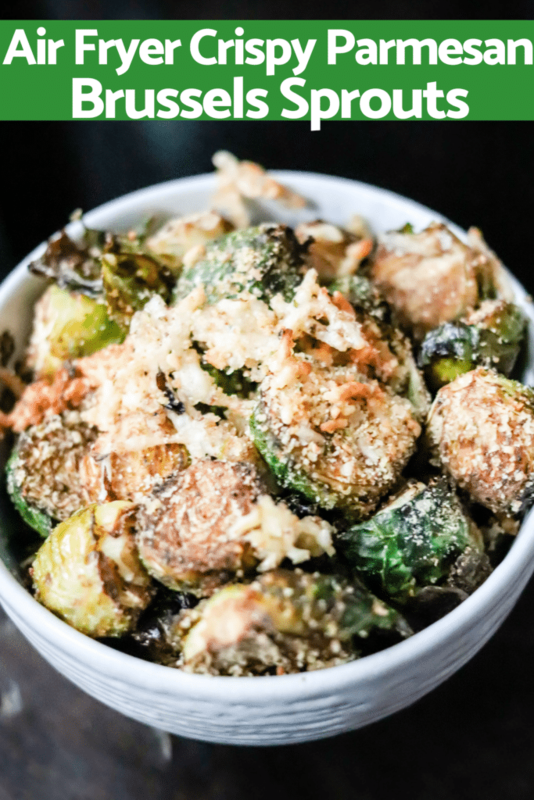 I have tons of healthy dinner ideas to go along with these Air Fryer Crispy Parmesan Brussels Sprouts as well! Make sure you try these Air Fryer Avocado Fries or Air Fryer Asparagus Fries too! Now, these are NOT your Grandma’s Brussels Sprouts. You may think you HATE Brussels sprouts, but trust me, you are WRONG! You need to either roast or Air fry. Brussels sprouts to make them crispy and delicious. Boiled soggy Brussels are no one’s friend, and if that is the way you have tried them, you need to try them cooked correctly ASAP. Prep the Brussels sprouts; chop off the little stem at the bottom, then cut them in half. 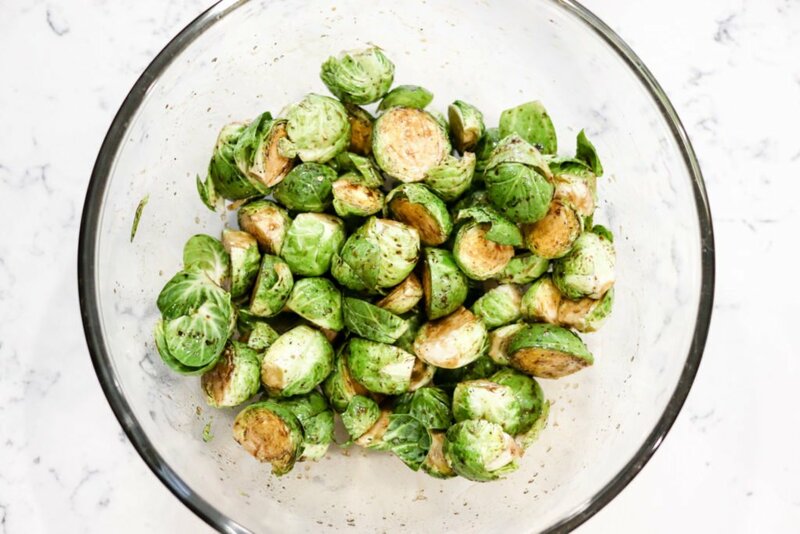 Using a medium or large bowl, place the halved Brussels sprouts into the bowl, then add the olive oil, balsamic vinegar, salt, and pepper and toss them around to coat. 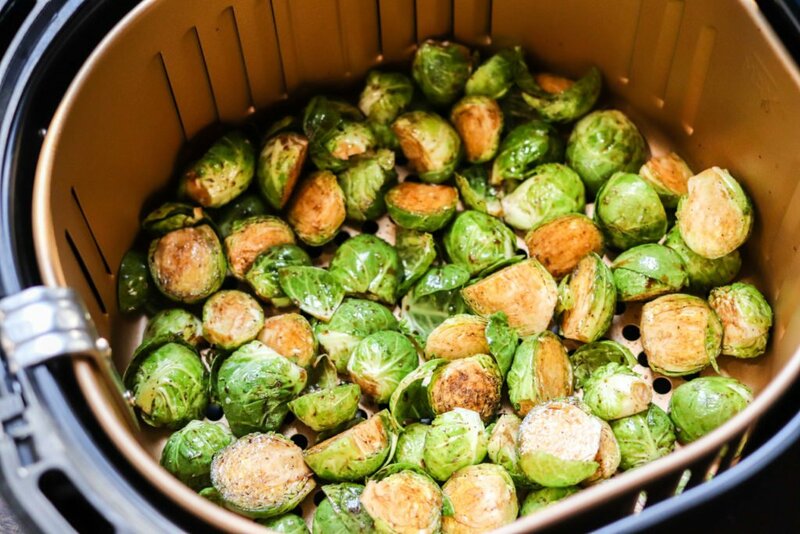 Using an Air Fryer, spread the Brussels sprouts into the basket, then close and turn the air fryer to 400 degrees and set to 5 minutes. While those are cooking, get 1/4 cup of bread crumbs and 1/4 cut parmesan cheese (I like to use freshly grated, but you can use pre-grated as well, just NOT the sprinkle type of parmesan). Once the timer beeps, open the air fryer and carefully mix the Brussels sprouts around. Spread them back in an even layer, then sprinkle the breadcrumbs and cheese over the tops. Close the Air fryer. and set for 5 more minutes at 400 degrees. 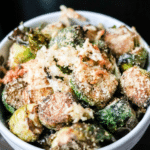 When the time is up, remove the Air Fryer Crispy Parmesan Brussels Sprouts and serve immediately! 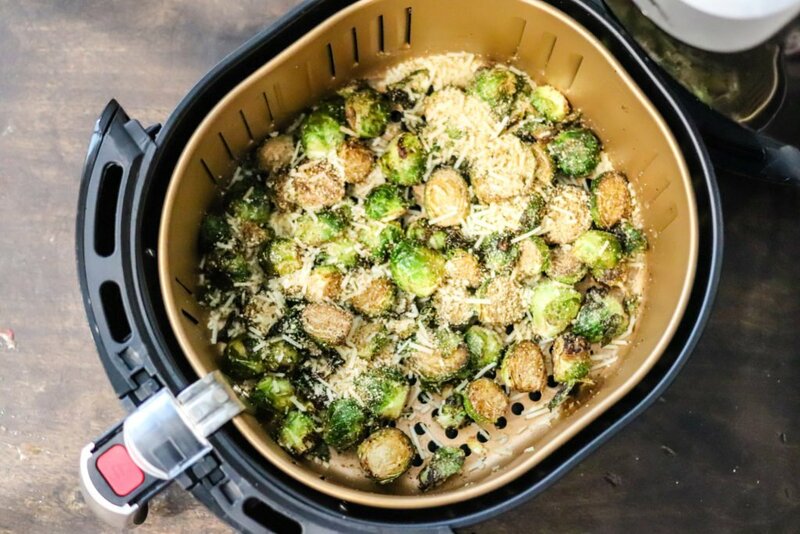 The Air Fryer Crispy Parmesan Brussels sprouts come out super crispy, cheesy, seasoned perfectly and majorly delicious! Are Brussels sprouts healthy or good for me? Yes!!! Brussels Sprouts are one of the healthiest foods you can consume, and they have very little calories for the amount of nutrients they provide! There are many potential health benefits associated with Brussels sprouts, including eye and bone protection. What type of Air Fryer should I use for Crispy Parmesan Brussels Sprouts? 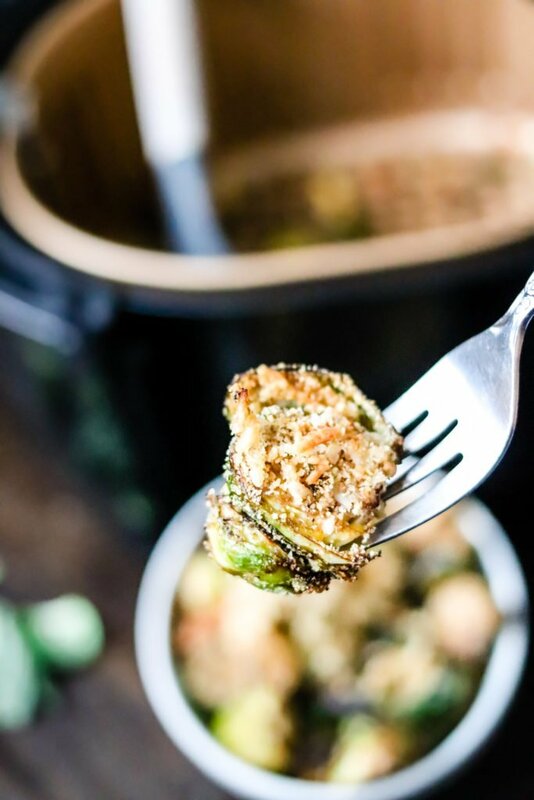 Air Fryer Crispy Parmesan Brussels Sprouts make the perfect side dish, or even meal in my case! Taking only TEN minutes to make, they’re super quick, easy, and majorly delicious! 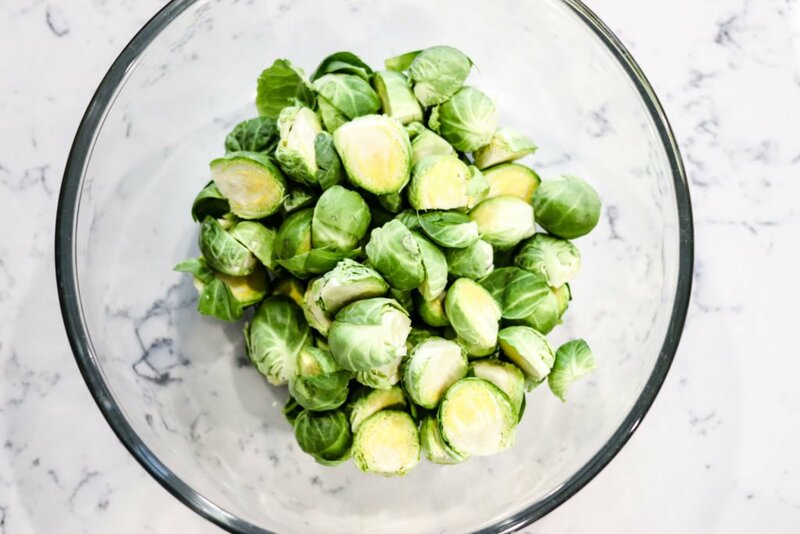 Using a medium or large bowl, place the halved Brussels sprouts into the bowl, then add the olive oil, balsamic vinegar, salt, and pepper and toss to coat. 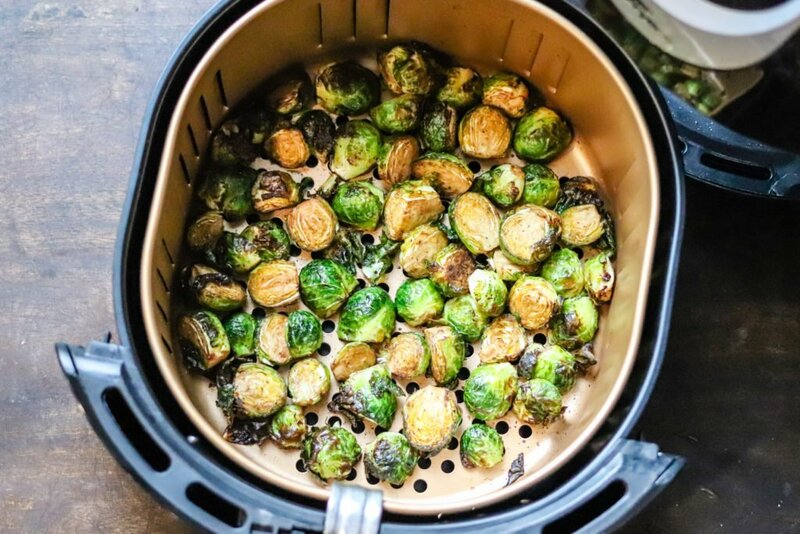 Using an Air Fryer, spread the Brussels sprouts into the basket, then close and turn the air fryer to 400 degrees and set timer to 5 minutes. Once the timer beeps, open the air fryer and carefully mix the Brussels sprouts around. Spread them in an even layer, then sprinkle the breadcrumbs and cheese over the tops (some might fall down into the cracks, that's okay). Close the Air Fryer and set for 5 more minutes at 400 degrees. Nutritional Info per serving: 132 calories, 5 grams fat, 17 grams carbohydrates, 4 grams fiber, 7 grams protein. This recipe just made me order an air fryer! YUM! These look so perfect! Love that they’re crispy. I cannot wait to try these! I just got my air fryer and this looks like the perfect recipe to start with! Yum! My husband loves brussels sprouts so I know he’s going to love this! I bet my kids would eat these up too. 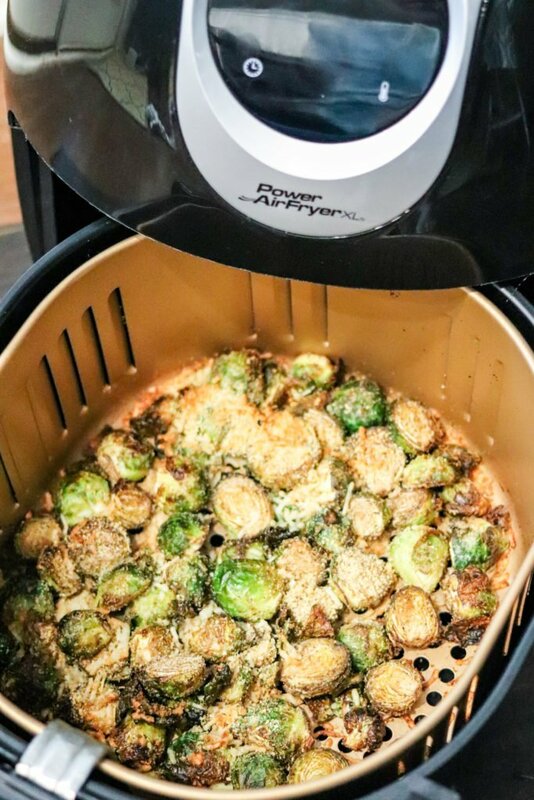 I love brussels sprouts and now I can make them in my air fryer…thanks!! So glad I tried this way of preparing Brussel sprouts! The only way to do it. These are amazing and so easy!!! I wish I had a huge bowl for my lunch today! Looks heavenly! Looks so good! I am totally drooling over this goodness! You would LOVE them!!! Air Fryer is definitely a game changer! My husband loves crispy wings. Thanks for a great recipe! What a perfect way to use the air fryer. I’m always stuck in things to do with Brussel sprouts. Thank you!! Absolutely delish! I can’t believe how good it comes out on the air fryer! Love the idea of making these in the air fryer! They look SO crispy and delicious! I just bought a 6 Qt. Air Fryer XL with a door and a rotating basket and 3 racks. I don’t have a pull out deep basket.